"There are an awful lot of people who think we have the best medical system in the world," said Dr. Christopher Murray, who directs the institute and is an author of the study. "The data is so contrary to that." Underscoring historic recent gains in global health, the number of children younger than 5 who die this year will fall to 7.7 million, down from 11.9 million two decades ago, according to new estimates by population health experts. 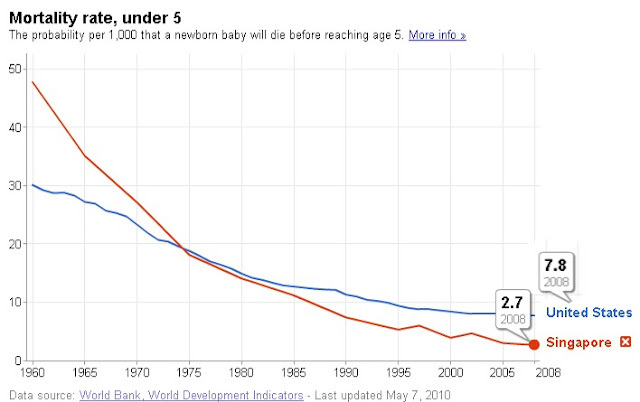 But as much of the world makes strides in reducing child mortality, the U.S. is increasingly lagging and ranks 42nd globally, behind much of Europe as well as the United Arab Emirates, Cuba and Chile. Twenty years ago, the U.S. ranked 29th in the child mortality rate, according to data analyzed by the Institute for Health Metrics and Evaluation at the University of Washington. The estimates, derived from modeling based on international birth records and other sources, are being published Monday in the British medical journal the Lancet.